I go to Ireland in less than a month! It’s going to be fabulous! I can’t wait for September! And how am I progressing on my goal of reading all those Irish middle grade and young adult books anywa…? Oh dear. I fell off the wagon. I’ve been so busy planning my actual trip and trying out Irish pub recipes that I’ve failed to read kid lit by Irish authors. EXCEPT! Look at this: today’s review qualifies! 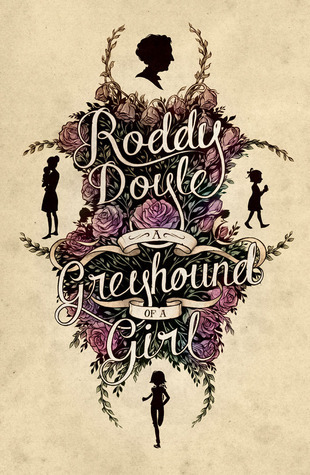 Roddy Doyle’s A Greyhound of a Girl is a lovely, haunting little book – a ghost story with heart. Set in Ireland. By an Irish author. I’m saved! Mary is a precocious girl whose best friend just moved away (such cruelty!) and whose beloved grandmother is in the hospital. She's at the intersection of childhood and teenage angst, and she's that special mix of angry-at-the-world/loving/rude that goes along with upsetting life change. Enter a ghost and the memories and perspectives of four generations of women in her family. The resulting interactions transform each woman, and show them the things that connect them all. Doyle’s strength is his dialogue – it is funny, moving, and only contains the absolute necessary – there are no info-dumps or long, over-wrought passages full of description. At the same time, this is not a spare, minimalist story – it is Just Right, as Goldilocks would say. Really, beautifully, right. It’s nominally fantasy (there’s a ghost! ), but it reads a bit like Patrick Ness’ A Monster Calls, the fantastical is woven into a very real, solid contemporary setting, with threads of the past woven in too with distinct narrators and voices. In all, A Greyhound of a Girl is a lovely little book that impressed me with its depth, its sense of place, and its sentiment. Recommended for: readers of all ages who appreciate funny, emotional fiction, fans of middle grade ghost stories, and anyone interested in Ireland as a setting for literary children’s fiction. I do enjoy Roddy Doyle's books. Have a wonderful trip to Ireland, it's such a beautiful place. Never read Roddy Doyle, always keep thinking I should. Sounds like this will be the one I start with. Have a great trip!